Jamie Fillol ranks among the all-time University of Miami tennis greats. 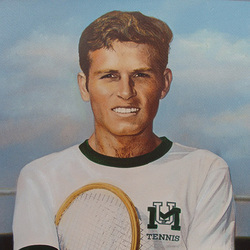 He was a two-time All-American during his collegiate days with the Hurricanes and brought priceless recognition to the University of Miami tennis program. Fillol made All-American in successive years, 1967 and 1968. The native Chilean had his finest collegiate moment in the 1968 NCAA championships when he reached the final round. In the title match, he played with an injury he sufferd earlier in the match and lost only after a bitter five set with Bob Lurz of USC. In NCAA doubles that year, Fillol and his partner Mickey Schad advanced to the quarter finals. Jamie Fillol was the University of Miami's No. 1 player for three yers, 1966, 1967 and 1968. He was captain of the 1968 team.